Former L.C. Bird quarterback Terrence Ervin has transferred from Louisburg College to Johnson C. Smith University. There were many reasons as to why Ervin chose to play at the CIAA institution. “I have a great relationship with the head coach and I feel like it was the best fit for me,” said Ervin. 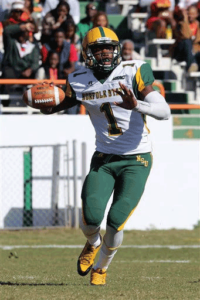 While with Norfolk State his first year, Ervin would play all 12 games, with his best game coming against Hampton as he threw for 335 yards and three touchdowns. He would transfer the next season to Louisburg, where he would split time at quarterback. He would throw for 1,908 yards and 18 touchdowns with 62 percent completion. “We went undefeated, and my stats were decent, being that I split time all season,” he said of his performance at the junior college. Ervin proved to be a very consistent quarterback when he led L. C. Bird to a 29-0 record over two seasons while winning back-to-back 5A state championships. The former Skyhawk says he is looking forward to the start of the season, and he is looking to surprise some people as well. “Right now they have us finishing 10th in the CIAA, but I feel that we’re going to shock a lot of people,” Ervin said. Johnson C. Smith is a Division II school located in Charlotte, N.C. The Golden Bulls are led by Kermit Blount, who is in his fourth year of coaching. Blount is also a native of Richmond. The Golden Bulls went 3-7 last season, and with the addition of Ervin, Johnson C. Smith will use Ervin’s strong arm to their advantage, being in need of a quarterback. Locally speaking, L.C. Bird basketball standout (and 5A state champ) Jaylen Dillard will attend the school this coming fall as well.